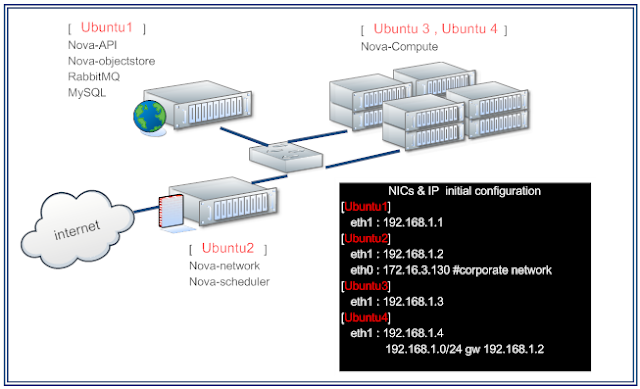 Two network nodes for OPENSTACK. The HA solution for nova-network , I focus on a direction of "Router HA". I found VRRP & GLBP protocols. [API]----->[RabbitMQ]------>[node2 query rabbitMQ]------>[scheduler]------>[compute node]------>[instance DHCP request from node1]------>[instance get metadata from node1 redirect to API server]. 1. Could I set same hostname for two network-nodes? bcz nova check hostname for component's job. 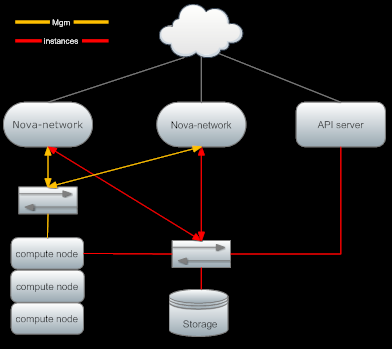 Btw, I'm awaiting for new release of OPENSTACK NOVA. In Diablo release , Compute node will redirect 169.254.169.254 to API server , instead of from nova-network(instance's gateway). If instance can route from a real router will be better . But I think the problem is how to assign public ip for instance is another course. In my consideration, that will be very hard to handle floating_ip. OR another choice is figure a better HA for nova-network. But it's a role as router in NOVA. That's a technical challenge . In my research , GLBP is a good protocol .